In Saturday night’s game at Duke, Syracuse showed how a basketball game gets out of control. The Orange played sloppily, gradually allowed the deficit to grow, and suddenly things quickly became completely out of control. SU stayed within arm’s reach of the Blue Devils into the minutes of the second half, but allowed a 13-2 run that turned the game into a blowout less then eight minutes into the second half and #5 Duke ran away with a 73-54 win. Syracuse (18-11, 9-7 ACC) was simply terrible on offense, finishing the game with 15 turnovers and shooting 30.6 percent from the field, including a brutal 3-of-30 from three-point range. Making things worse was that a handful of those turnovers came in transition, short-circuiting the Orange fast break and taking easy points off the scoreboard. The Blue Devils (26-3, 13-3), in contrast, shot over 48 percent in the game, including 54.2 percent after the break. Duke also shot 6-of-13 on three-pointers after starting the game making only 2-of-10 from long range. They also had a 38-26 advantage in points in the paint over the Orange. 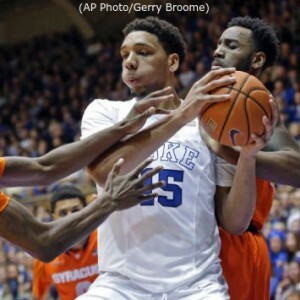 Duke jumped out to a 4-0 lead on a pair of lay-ups, the second coming after their full court press forced a quick and easy Syracuse turnover. SU turned the ball over against the pressure on their next possession, but were fortunate the Blue Devils could not take advantage. Tyler Roberson led the Orange on a 9-2 run to take the lead. Roberson scored on a couple of putbacks, then Michael Gbinije found him wide open under the bucket in transition for a three-point play. Roberson’s free throw to cap the run gave SU a 9-6 lead coming out of the first media time out of the night. Duke scored twice to take the lead back, but Gbinije dropped in a soft fadeaway from in close for an 11-10 lead. A couple minutes later, Trevor Cooney had a pair of foul shots to nudge the SU lead to three. The Blue Devils owned the next six minutes of the game, however, scoring 14 of the game’s next 17 points to take a 24-16 lead with less than six minutes to go in the half. Rakeem Christmas broke the stretch with his first field goal of the game and Gbinije hit a three from the right corner a couple minutes later to draw the Orange within five, but the Blue Devils scored on their next two trips, the latter after pulling down a pair of offensive boards, to make it 30-21. Duke would take a double-digit lead for the first time on a pair of free throws with just over a minute left in the half, but Syracuse struck back with a basket when Ron Patterson got a lay-up off a nice give-and-go play with Christmas to make it 34-25 at halftime. The Orange started the second half with a focus on pounding the ball to Christmas and it paid off. 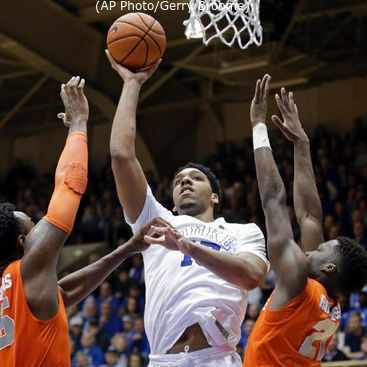 The senior center scored on three straight trips, but Duke kept pace, alternating their lead between seven and nine points. But then, Duke got hot from long range, hitting three triples to power a 13-2 run and blow the game open. It only took six possessions, but the Blue Devils inflated their lead to 51-33 less than eight minutes into the second half. A Gbinije three from the left side slowed the bleeding, but Duke would nudge the lead to 20 points just after the midpoint of the half on a free throw after Christmas was whistled for his fifth foul. From that point, it was just empty contributions to the stat sheet for SU. Duke would later score six straight points to go up by 22, but the Orange would also hang six consecutive points, including a three and lay-up from Cooney, who would end the game by scoring nine points in the final 3:16 of the game. Four Syracuse players reached double-digits in scoring, combining for 52 of the team’s 54 points. As he did earlier in the season, Tyler Roberson played his best ball against Duke, this time posting team highs of 16 points and nine rebounds. Trevor Cooney’s late flurry pushed his total to 13 points and Michael Gbinije had a dozen points and four steals. Both players shot poorly, though, as Cooney was 5-of-16 from the field and Gbinije even worse at 5-for-20. Rakeem Christmas had 11 points before fouling out. Justise Winslow led all scorers with 23 points for the Blue Devils, including three triples and also blocked three shots. Quinn Cook added 17 points, including 13 after the break, while Jahlil Okafor had 13 points and a game-high 14 rebounds. Tyus Jones chipped in nine points, as well. The Orange will close the home portion of their schedule on Monday when #2 Virginia visits the Carrier Dome for Rakeem Christmas’ final home game at SU. The Cavaliers (27-1, 15-1) bring an eight-game win streak with them and can sew up the ACC regular season championship with a win. 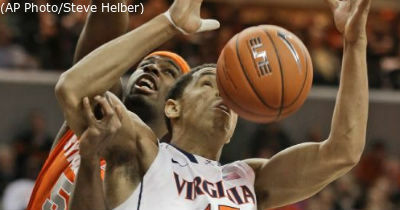 Virginia has been without the services of second-leading scorer Justin Anderson for the last five games due to an injury, but have not missed a beat due to their outstanding defense. The Cavaliers, who play at one of the slowest paces in the nation, permit the fewest points in the nation at 50.1 per contest and have allowed 60 points or more only four times on the season. ESPN will televise the game, which will get underway at 7:00pm Eastern tip time. In addition, the telecast can also be streamed at ESPN3.com.